Looking for title and author. This is a novel I read back in high school. Ended on what appeared to be a cliff-hanging transition to a follow on novel. I wasn't crazy about the story, but did wonder how it turned out. Back before the Web it was difficult to keep track of not-very-famous authors ! Here's what I remember: The main character is a male research physicist whose last experiment accidentally puts him (and the chair he sat on) into an apparently unrecoverable stasis - read indestructible statue. One night, 1000's of years later, a lightning strike revives him (lightning can do anything, eh?). Although he meets/befriends other intelligent beings, some very similar to human, he finds they are of species gene engineered/uplifted - possibly by the long lost human race. His new friends have been fighting a losing war against a nearly world spanning intelligent forest that wants to dominate the remaining planet surface and species it doesn't already control. 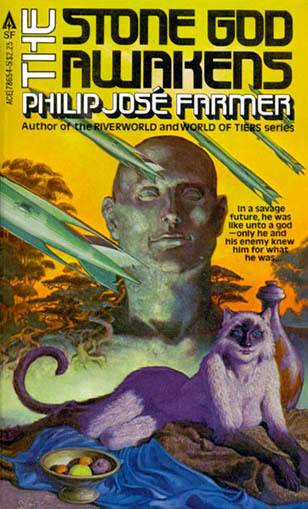 Near the end of the book, the man communicates with the forest by direct contact and learns that it has memories that go back to the time of humans - before some wrathful alien race hunted them all down. It turns out the forest and many of its subservient species are also result of humanity's work. Since the man has joined the fight against the forest and has knowledge of long lost science (think herbicide), the forest sees him as a/the prime threat to it's plans. I've looked high and low on the Web with every combination of likely search terms I can think of and have struck out. Hopefully a human brain out there can help me? Thanks! A scientist in the 1950s is rendered frozen at the molecular level, and is reanimated millennia later by a freak accident to a strange world populated by sentient, anthropomorphic animals, who take his awakening to be the fulfillment of prophecy. He accepts the mantle of godhood and sets about discovering this brave new world, hoping to find clues to the past while finding his place as the last human... or is he? To find the answers he must lead his tribe of feline worshippers to the heart of a rival god- a great tree spanning half a continent. Not the answer you're looking for? Browse other questions tagged story-identification novel post-apocalyptic uplift stasis or ask your own question.